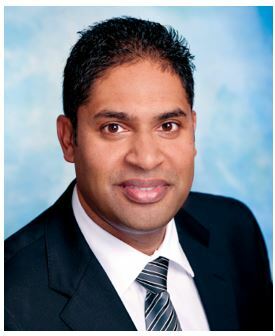 UGEN MOODLEY, KPMG's managing director in KwaZulu-Natal is a dynamic, experienced chartered accountant who has progressed through the leadership ranks of KPMG having been appointed as a partner in 2005. He is also the Head of Advisory - KwaZulu-Natal and his areas of specialism include governance, risk management, internal audit and overseeing the provision of audit, tax and advisory services in complex public and private sector environments. Moodley commented that he is excited about the future of the profession and he looks forward to leading KPMG's continued growth in KwaZulu-Natal. He added, "My career has been driven by the opportunities that my long association with KPMG has provided. The journey has not always been an easy one; at times it has been tough. I started off in 1997 as a young and inexperienced clerk, from a disadvantaged background, and I had to fight to prove myself." He added that the early years of his studies and career were challenging as he had the misfortune to lose his father, his older brother and sister-in-law at this time. However, Moodley said that his wife, Kogie, and his mother have played very supportive roles while he was learning to find his feet in the business world. In addition, the ability to persevere and strive for success saw Moodley through these early challenges. The journey with KPMG also included a large number of firsts. These experiences include his first local flight, his first international flight and his first international experience, which was a three month project in the United Kingdom. This international experience was later followed by a month in Saudi Arabia where he set up a new internal audit function in that region. Other highlights of his career include participating in partner development programmes in Spain, Italy and Cuba. Moodley said, "These were fantastic experiences, which have enabled me to grow into the person that I am today." An awareness of the challenges of his professional journey is reflected in his approach to his current team, who he describes as young and dynamic. Moodley has an inclusive leadership style and enjoys adding value to clients and 'bringing people to the table'. He added that he is nurturing of his team and encourages them to focus on the areas that they are good at so as to provide opportunities to succeed. He endeavours to surround himself with the best people who are able to deliver high quality services. In addition to his strong technical and leadership skills, he says, "my major strengths are that I am very approachable and get on well with people." These are invaluable personality traits in his profession, as he is able to build relationships with staff and clients, which together with his expert knowledge, has earned him the title of 'Trusted Advisor'. Moodley said, "KPMG in KZN is a thriving practice and we have invested in multi-disciplinary teams who can pool their skills to the benefit of our clients. We employ people who have experience and expertise in both the public and private sectors and in diverse industries such as healthcare, education, manufacturing, IT, mining, petroleum, agriculture, tourism and gaming to name a few. The team also comprises engineers, a medical doctor, a systems architect, major capital project specialists and lawyers amongst other specialists. We differentiate ourselves from our competitors who are not able to have these skills readily available in KZN." The KPMG team also works on significant projects in listed companies, state owned companies, government departments and municipalities, including Nedbank, Tongaat Hulett, Rio Tinto, Transnet, KZN Provincial Treasury, eThekwini Metro, Hulamin and Unilever. The fact that these projects have an impact on the economy as well as on the lives of many people through job creation gives Moodley both professional and personal satisfaction. He said, "We have a strong understanding of the public sector and our participation also ensures that there is proper governance." Moodley believes that South Africa requires more innovative responses in order to creatively address the problems and challenges that face the country. He said, "We can't keep doing the same thing, we need to do things differently. You must be the change that you want see in the world." He added that KPMG South Africa plays an important role in driving the innovation and digital space. He said, "One can see the true might of the firm; that KPMG SA can play in this space is wonderful." Moodley is happily married and has a close knit family, so much so that he struggles to spend time away. He is delighted that he is able to give his two sons the opportunities his family could not afford when he was growing up. He is passionate about football, playing twice a week, and is an avid golfer.